*The user will need both the Alma permissions – Course Reserve Manager and Course Reserve Operator to use the Reading List Application to create courses in Alma. 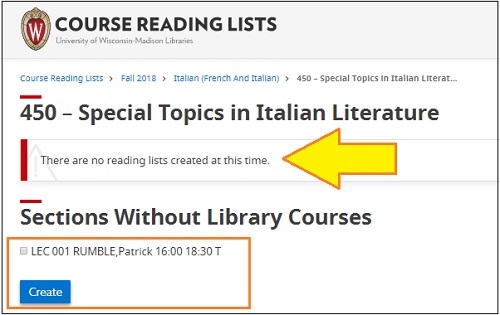 *** If you just adding Reading Lists or editing them in Alma you only need the Course Reserve Operator. Summary: Before you can create a reading list for a course you must check the Course Reading List app to see if the Course has been created, and whether there are already any reading lists associated with any of the sections. You will use this app to generate a course and select the specific sections that will be associated with the Reading List you are going to create in Part 2 in Alma. To log in or get to the staff view click login in the upper right-hand corner and click login. If there is nothing listed, there are no courses being offered in this department for that term. 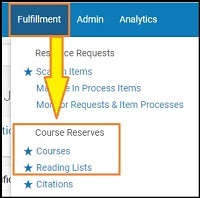 If you see a box as below, where there is a Link to a Reading List for a section, then the course has already been created in Alma and you can add or edit a reading list (skip to Part 2 below). If the course is cross-listed, the system will automatically import the relevant metadata the cross-listed departments. or will cover the other course. You should be okay. If there are multiple sections with the *same* reading list, then check all the section boxes and hit Create. This will bundle them together in Alma and allow you to use the same Reading List. 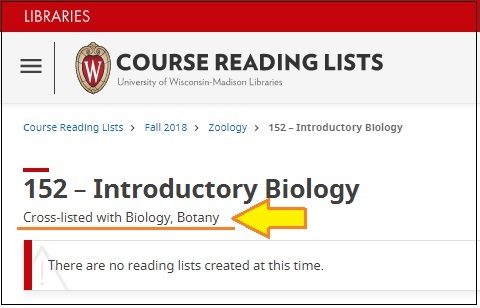 If there are multiple sections with *different* reading lists, then you need to create separate courses for each section. If the course is a Meets With course, each component course and reading list must be added separately. See the Advanced Functions section at the bottom of this KB article for detailed instructions for Meets With courses. 2. At the top choose "Fulfillment"
3. Under Course Reserves, choose "Courses"
4. There is a drop-down menu to filter your search by Course name, Instructor, or Course Code ( = course number). You cannot search or sort by the department. For example, to locate the course "English 156", enter 156 in the Course Code field. 5. Within the results list, find your course entry. 6. Click the ellipses menu (...) on the line for your course. to "Edit" (on the right-hand side of the row). CAUTION: Clicking in the Code column in the results lists takes you to the Manage Course Information page. DO NOT EDIT anything in the Course Information tab. You may add (optional) Instructor names or notes. If you got to this page inadvertently, click Cancel or the blue Back arrow to return to the result list. 7. 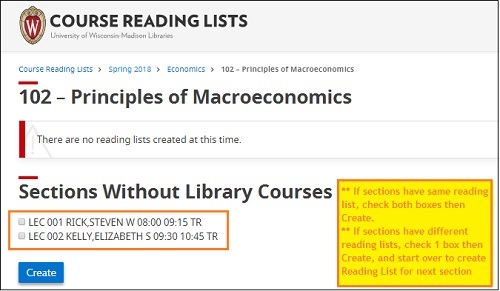 To Add or edit the reading list, click on the ellipses menu (...) to select "Reading List"
If a reading list already exists for the course, you may edit that list. Click on the ellipses (...) and select "Work On" to edit. If no reading list exists, click "Add Reading List"
You will need to input a Reading List code and name of the reading list. For consistency, use the Department Code in parentheses in this spreadsheet (example below). You can copy the code from the spreadsheet. DUE BACK DATE: LEAVE THIS FIELD BLANK (procedure update 9/19/18). If a date there is a date in the field, click the X to clear the field. This way the items in the reading list will not automatically generate a restore request and pick up list. 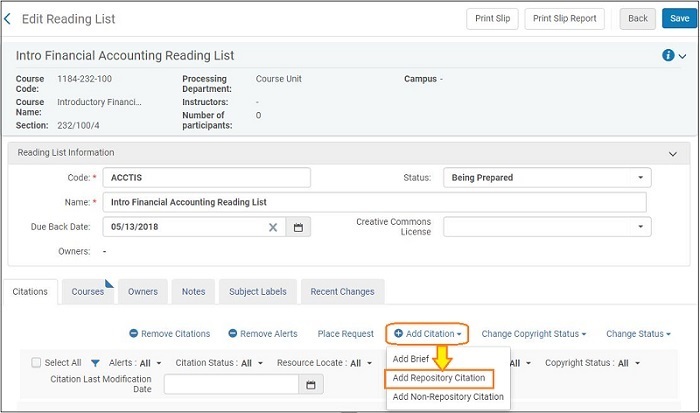 To add resources (books or articles) to the list click "Add Citation" and choose "Add Repository Citation" from the drop-down and then search Alma by title, barcode, etc. 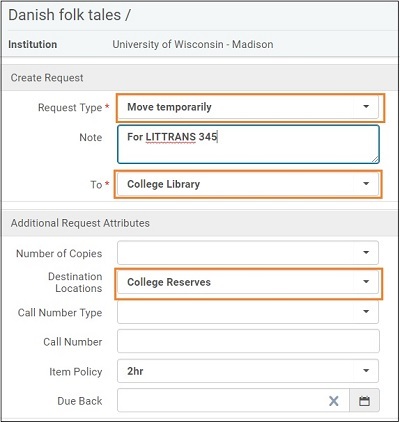 Locate the correct record in Alma search results, then check the box next to the entry you want, then click Select to add to the Reading List. CAUTION: Adding a citation to a Reading List does not automatically put it on reserve! You still need to place the Temporary Move request in order to change the status to On Reserve, or initiate the move request. See https://kb.wisc.edu/library/internal/page.php?id=51899 for detailed instructions. 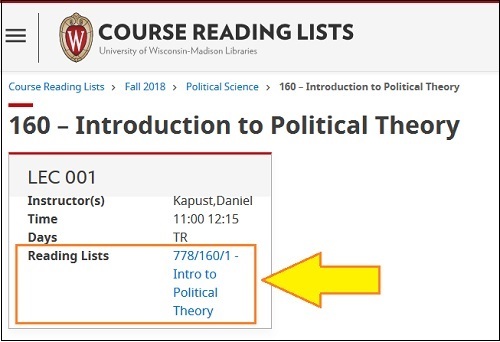 From the Course's Reading List page, from the elipses (...) menu select "Work On" - from there you are on the Edit Reading List page view and can see a list of titles in the list. iii. Change the Destination Location to your Reserves location. iv. Change the item policy to 2 hr or whatever you use.This will save time allowing it to stick when the item is scanned in. d. Repeat for the other physical items on the list. a. Create only of the courses in Alma using the Course List App. The app will automatically add another other ID so the reading list displays in both places. b. Create the Reading list for the course. 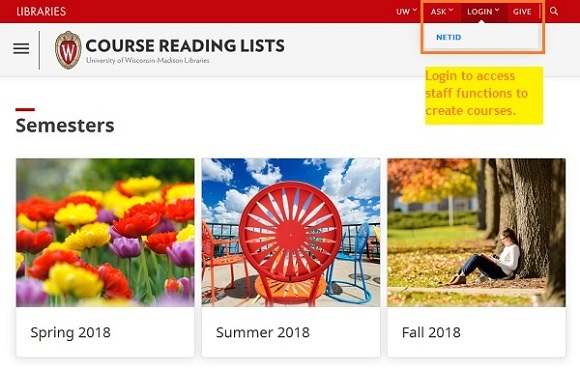 c. Check both courses in the course list Application to make sure they both display properly and the Reading list is displaying in both places. Instructions for Meets With Courses. a. Follow the steps outlined above, creating separate courses for each Meets With component course. b. In Alma find the courses and add a note to say that it is a Meets With Course and add the other course info. c. Complete steps II-III in the first course to create the Reading List and attach the items and request them for the library. i. Click on the (...) elipses and click on Copy Reading List. Alma should bring up a list of reading lists. ii. Select your list and click Save. Alma has two options: copy reading list and duplicate. It is best to duplicate it so all the metadata is the same - add a 2 or another number to the end of the code and name to get it to save. Alma won't let required fields be exactly the same. View hidden just allows you to see the hidden fields in Alma. They are usually extraneous fields that you likely might not need when working in this area. VI. Copying Reading Lists and retaining them. a. 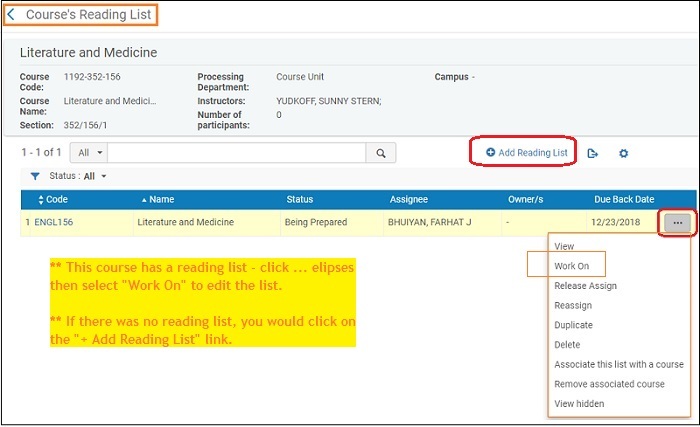 It is possible to copy the previous semester reading list to the current semester by using the copy function. b. It is also possible to save a reading list for those courses that have extensive ones by clicking remove associated course. VII. Once a year it is advised to clear the reserves. a. Alma can supply a list of courses and reading lists that are coming due the end of June. b. Prior to the end of June any lists or items that are to be retained should be marked on the spreadsheet and a job can be run in Alma to extend the active date out until the following June.